Senators advanced a bill March 15 that would make it a criminal offense to threaten someone with a text or email message after adopting an amendment related to chip-based payment cards. Under current law, a person commits the offense of intimidation by telephone call if he or she telephones someone with the intent to terrify, intimidate, threaten, harass, annoy or offend. The offense is a Class III misdemeanor with a maximum penalty of three months in prison, a $500 fine or both. 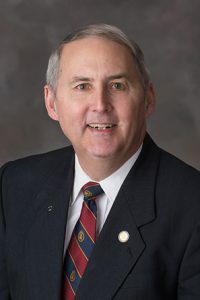 LB773, sponsored by Sen. Robert Clements of Elmwood, would amend the law to include intimidation by electronic communication, such as a text message or an email. It also would remove the terms “terrify,” “annoy” and “offend” to address a possible conflict with the First Amendment. Omaha Sen. Brett Lindstrom introduced an amendment on select file, adopted 35-0, that would add provisions from his LB811. These would update Nebraska law to reflect new payment card technology and make it a crime to possess a scanning device or encoding machine with the intent to use it to obtain information encoded on a card without authorization from the card’s user, the card’s issuer or a merchant. Lawmakers voted 38-0 to advance the bill to final reading.